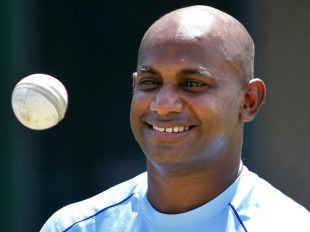 Sanath Jayasuriya, the former Sri Lanka opener, was one of six players to be valued at the maximum price of $35,000 in the local player portion of the draft for the inaugural Sri Lanka Premier League. The other five other players valued in the top bracket were current Sri Lanka internationals Dinesh Chandimal, Chamara Kapugedara, Nuwan Kulasekara, Thisara Perera and Rangana Herath. In all, 107 local players were drafted. The 43-year-old Jayasuriya, who played for the Mumbai Indians in the first three seasons of the IPL, was selected in the ninth round by Kandurata on Friday in Colombo. Jayasuriya also played for Khulna in the first season of the Bangladesh Premier League earlier this year. Chandimal was the first Sri Lanka player to be drafted when he was selected by Wayamba with the day's first pick. Perera and Kulasekara were the second and third players picked, by Kandurata and Nagenahira respectively, while Uthura selected Kapugedara with the fifth pick, according to the results released by Sri Lanka Cricket. Herath was taken in the second round by Basnahira. Chaminda Vaas, the former Sri Lanka fast bowler, was valued at $25,000 and selected by Wayamba in the 11th round. Angelo Mathews was named icon player of Nagenahira, taking the place of Shahid Afridi. The franchise had decided to release Afridi before the international players' draft as they wanted an icon player who would be available through the tournament - Afridi could potentially miss the semi-finals and finals of the SLPL due to the recently announced Pakistan-Australia series. On Thursday, 56 foreign players were picked by the seven franchises via the same draft system, giving each franchise a preliminary list of 24 players. The teams will now prune that list down to 18 players comprising 12 Sri Lankan and six foreign players, one of the tournament organisers told ESPNcricinfo. The remaining six players - four Sri Lankan and two foreign - then become part of the supplementary list for their respective teams. In case of an injury to a player in the primary squad, teams will be allowed to replace the injured player with a player from the supplementary list. One player who is likely to find himself on the supplementary list is Adam Voges, who was picked up by Kandurata. Voges is currently Nottinghamshire's Twenty20 player and the county insists his obligations at Trent Bridge will be met in full.